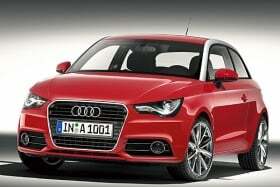 The A1, Audi's smallest model, is a rival to BMW's Mini. BERLIN (Bloomberg) -- Audi will probably beat its target for A1 deliveries next year and may further increase production to meet demand for the entry-premium model, the unit's sales chief Peter Schwarzenbauer said. Audi anticipates selling 120,000 A1s in 2011, compared with its previous projection for 100,000, and may boost the goal for a second time, Schwarzenbauer said. The model, which went on sale at the end of August in Europe, has sold out Audi's allotment for this year since mid-November. “After getting feedback from our dealers, it's clear that our production rates may need to be increased again to satisfy demand,” the executive said. “We are extremely confident that the A1 will be a huge success for us and are running far ahead of plan in some markets,” including the U.K. and France. Audi, which aims to topple BMW AG as the luxury leader by 2015, is targeting record worldwide deliveries this year of more than 1.08 million cars and sport-utility vehicles, an increase of 14 percent from 2009. Eleven-month sales climbed 15 percent to 1 million vehicles, already surpassing Audi's previous full-year record set in 2008. Audi's smallest model is designed to vie for affluent young customers with BMW's Mini in the upscale small-car segment. It's unclear whether Audi's three-door hatchback will succeed, said Tim Urquhart, a London-based analyst with IHS Automotive. The average selling price for the A1 is about 24,000 euros ($32,000), 52 percent more than the model's starting price of 15,800 euros in Germany. Mini starts at 15,550 euros. Audi predicts that A1 demand will get a further boost when it introduces a version with a less powerful and cheaper diesel engine than the current 1.6-liter diesel, which starts at 18,800 euros. It also plans to sell the cars in markets such as Brazil, Argentina, and eventually China. Audi, which is targeting 30,000 A1 sales this year, sold about 21,000 vehicles through the end of November. Audi also expects the A1 next year to come close to matching the German sales of BMW's Mini, which is available as a hatchback, wagon, convertible, and four-door crossover. “We are doing this with one derivative, while Mini has four,” Schwarzenbauer said. Audi has no plans to sell the current A1 in the United States, but the company has said it may export the next generation to the U.S.